Receiving a breast cancer diagnosis is a devastating and stressful event for thousands of people each year. At About You Mastectomy Boutique, our goal is to help you retain a sense of normalcy and confidence as you progress through your treatment. We understand that shopping for clothing can be difficult both during and after treatment, and our mission is to make shopping for clothing as easy as possible for anyone affected by breast cancer. Today’s post will help you choose the right clothing and garments for your needs. Visit our mastectomy boutique in Tampa to view our wide selection of compression garments and wigs for cancer patients. Mastectomies, or the removal of one or both breasts, are a necessary component of some breast cancer treatments. Though many patients opt for breast reconstruction when treatment ends, many choose to wear mastectomy bras instead. Mastectomy bras are very similar to regular bras, but they have small pockets sewn into the cups that provide space for breast prostheses. Breast prostheses provide the appearance of natural breasts, and the breast forms and mastectomy bras available today provide the wearer with a figure that is nearly identical to their former self. Most mastectomy bras do not use underwires and are bilateral, meaning that they have room for one or two prostheses. Compression garments are primarily designed to prevent lymphedema from occurring during and after breast cancer treatment. Lymphedema is swelling that occurs in the arms and legs as a result of damage to the lymph nodes during treatment. Compression garments prevent lymph fluid from building up wherever they’re worn, and they can be purchased in varying levels of pressure. Many compression garments require a doctor’s prescription, so speak with both your doctor and your insurance company if you’re curious about compression garments. At About You Mastectomy Boutique, we carry soft, breathable, and latex-free compression garments that will help you manage and prevent the symptoms of lymphedema from interfering with your life. Whether you’re choosing a wig or a turban, it’s important that the item you choose is comfortable, durable, and practical. We understand how stressful it can be to lose your hair during cancer treatment, and wigs can help you retain your identity and a sense of normalcy during your treatment. Our wigs are designed by Raquel Welch, a Hollywood legend and international beauty icon. If you’re not sure that a wig is the right choice for you, we have a wide variety of turbans for cancer patients that can protect your head from the sun and provide you with a classy, elegant look. Our turban hats are manufactured using rich, soft fabrics that can be dressed up with pins and other accessories for a fun and stylish look. Whether you’re wearing a turban full-time or only during the times that you remove your wig, we’re confident that our mastectomy boutique will provide you with everything you need to achieve the look you want. 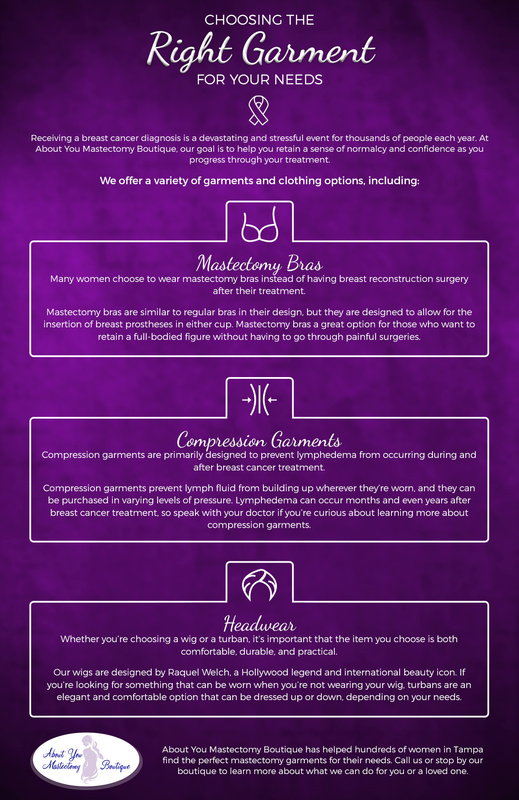 About You Mastectomy Boutique has helped hundreds of women in Tampa find the perfect mastectomy garments for their needs. Call us or come by our store to learn more about what we can do for you or a loved one.